LAHL’UMLENZE: Zulu students perfoming ingoma at the Wits Library Lawns on Wednesday during the Heritage Day celebration. The Students Representative Council (SRC) organised a competition for five societies to showcase their traditional dance, songs, food and outfits. The Tsonga’s Khomanani Vatsonga Society won the competition by charming the audience with their makwaya and xibelani dances. Photo: Sinikiwe Mqadi. 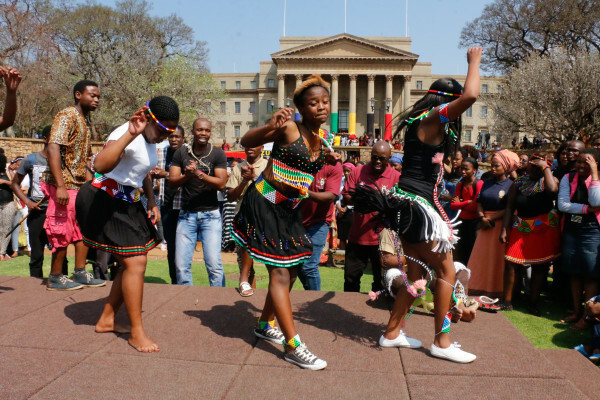 Witsies celebrated Heritage Day at the Library Lawns on Wednesday through dance, songs, traditional outfits, food and a traditional dance competition. Xhosa students opened the stage dancing umxhentso, followed by Venda students with their tshigombela and tshifasi dances. Zulu students, came second in the competition with their high kicks for their ingoma. But it was the Tsonga’s students hip twisting and bum shaking makwaya and xibelani which were most loved by many students who declared them the winners for the dance category. The Students Representative Council (SRC) organised a competition for student societies to celebrate Heritage Day. SRC deputy president Omhle Ntshingila said the aim of the event was to make students celebrate and learn diverse African cultures. Ntshingila said all students come from different places but that doesn’t mean that they don’t get people who share the same culture with them in Johannesburg. “We have to keep our culture because we don’t want our children to only read about our culture in iPads, we want them to see that my mother can still make a traditional beer even when you stay in New York,” Ntshingila said. Students who were part of the audience were also dressed in their traditional outfits, chanting and screaming to performers and going around the tables to taste food. Molatelo Phanyane, 1st year BPharm, said she learnt a lot about her culture. “I come from Venda, I have always heard about thongolifhe but I had not seen or eaten it before until today,” said Phanyane. Another first-year BPharm student, Thembelihle Mzimela, said she learned about other people’s traditions. There was some strife on the day following the dance competition, with some Zulu students complaining that the competition was not fair. Thobani Mabuza, 1st year BSc, said they didn’t know that the competition allowed them to use the sound system like Tsonga students did. “They robbed us last year, Tshwana students were declared winners and they are robbing us again this year, we will no longer participate in this competition,” Mabuza said. “We are not complaining because they performed better than us, rather because they entertained the crowd with music, and the crowed screamed. But we beat them in performance,” said Mabuza. But the Tsonga students denied the accusation. Vukosi Rikhatso, Psychology Honours, who performed in the Tsonga group said everyone was asked if they will need a sound system during their performance. “It’s a mistake to say we robbed you because we were all given a chance to tell the SRC whether we will need sound or not, so you didn’t say you will need it,” said Rikhatso. Students’ societies that participated in the event are Khomonani Students Society, West African Student Association, Xhosa Students Society and Zulu Students Cultural Society. Ndebele, a Zulu man from Msinga, KwaZulu- Natal has found himself struggling for fellow workers from the defunct Wits contractor MJL Electrical. “If you called me Mazankosi I would give you anything you want,” Richard Ndebele said, smiling and giving his Zulu clan name. Ndebele had arrived late for our interview. “I’m coming from a solidarity meeting,” he said, apologising. “It’s hard, but I can’t stop fighting now. Our families are hungry. Wits management doesn’t care about uneducated people,” he said in English and Zulu. 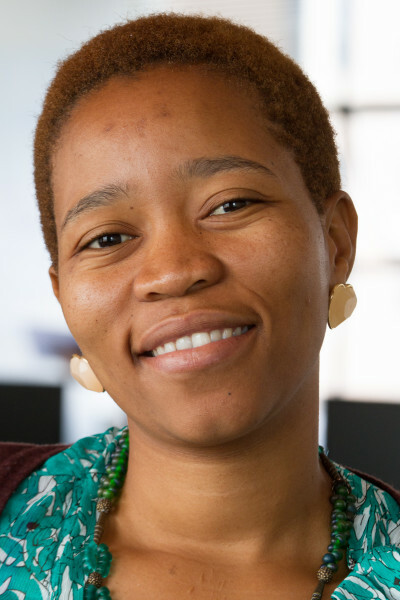 Ndebele, 39, matriculated in Msinga, KwaZulu-Natal, and then came to Johannesburg, looking for work in 1995 – a year after the first democratic elections. Initially, he found only temporary jobs paying less than minimum wage. He pursued an electrician’s certificate, and his diligence was rewarded in 2011, when he was hired by MJL Electrical, a firm contracted by Wits to maintain its electrical systems. Problems for Ndebele and his 22 co-workers began late last year, when MJL began paying irregularly. Their work was also obstructed because MJL was not purchasing the material needed for electrical maintenance. They complained to the Wits administration, to no avail. In February they discovered that the money deducted from their pay for unemployment insurance and pensions had never been deposited to the appropriate accounts. 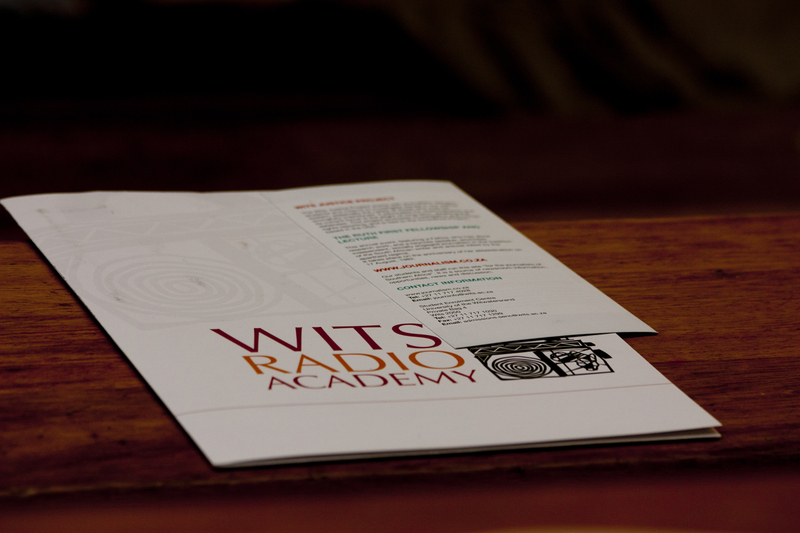 The employees filed a complaint with the Wits Legal Office. They also asked the Wits community for support. Ever since, MJL workers have been struggling to recover their wages and unemployment benefits. Ndebele has emerged as their leader. “These people had a union that is supposed to help them, but it has failed. Now they have no one to help them. So, I took it into my hands that I will help,” Ndebele said. 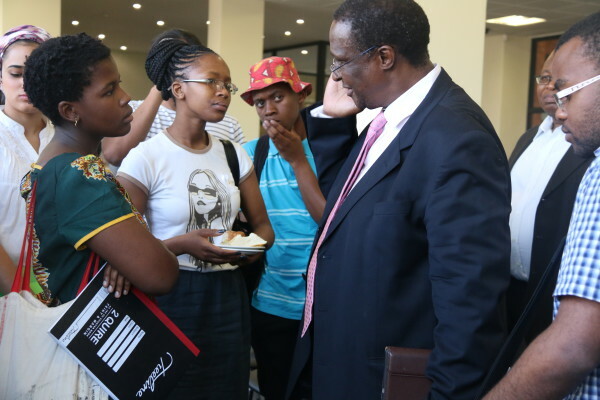 Ndebele has kept copies of the photos and correspondence he sent to Wits to report the problem, and audio recordings of meetings with Wits administrators. The decision in 2000 to outsource service workers at Wits followed outsourcing at other universities. This nation-wide move towards privatisation arose from government economic policies. Cost cutting became paramount, and services were outsourced to achieve it. Outsourced workers suffered losses in pay, benefits, job security and dignified working conditions. “The problem here at Wits is that, as contractors, we are not treated as people. They treat us like tools – because you use the tool, and when you are tired of it, you just throw it away,” Ndebele said. When the MJL workers asked for community support, the Wits Workers’ Solidarity Committee was ready. They joined the workers in launching a series of actions, twice occupying the office of MJL owner George Cresswold, demanding payment. The electrical workers asked Wits to employ them directly. Habib said Wits could not afford it. The costs would double, and higher payments for insourcing would have to be offset by increases in student fees. “MJL workers have been treated badly by their boss. Wits does sympathise. But we cannot employ the workers” Habib said. MJL has been liquidated, but the MJL workers have still not received their wages or unemployment benefits. Still, their struggle has stimulated significant commitments from Wits. 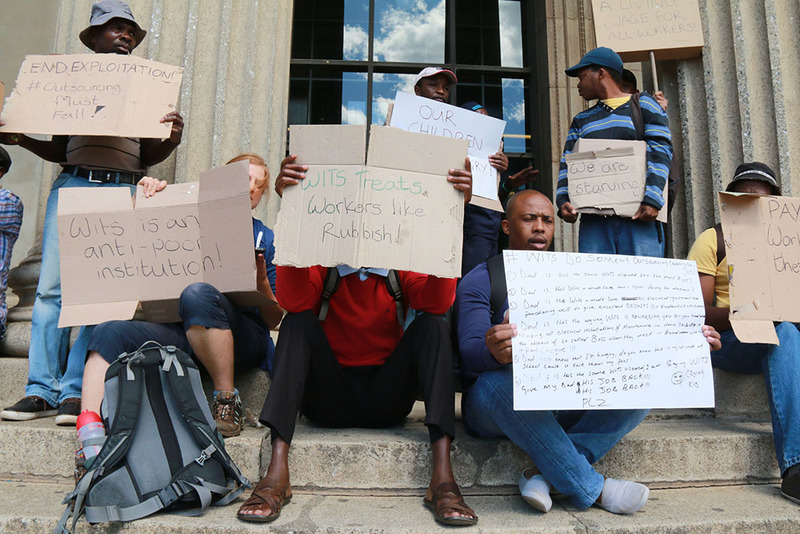 In a May 21 communiqué, Habib promised that as a “stop gap” measure, Wits would monitor outsourcing companies to ensure they comply with workers’ rights. 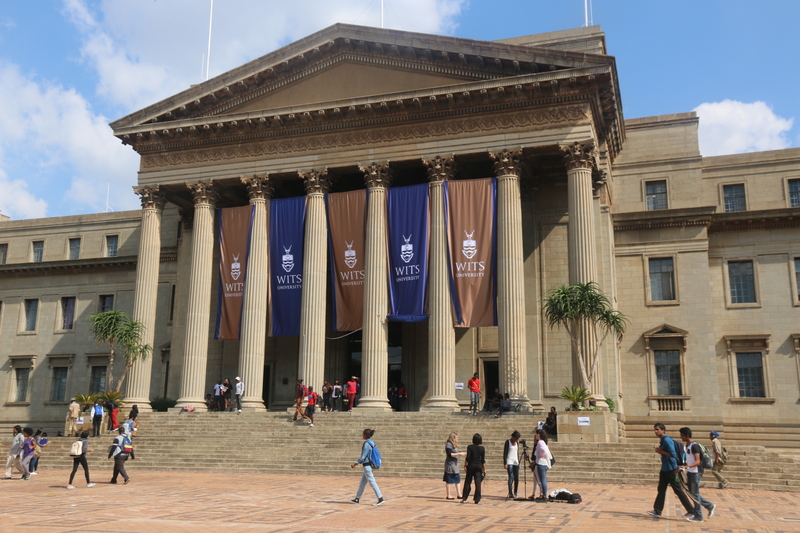 For the long term, he proposed strategies to win an increase in government support, allowing Wits to insource service workers without increasing student fees. The MJL workers are still jobless. The other outsourcing companies have declined to hire them. Ndebele believes the companies view him as trouble. Adam Habib offered a suggestion. In his August 8 Town Hall meeting, he encouraged workers like Ndebele and his colleagues to form worker cooperatives, and compete for the contracts. Ndebele doesn’t see cooperatives as a solution, though. “Registering a company is expensive, and workers will end up fighting with each other,” he said. 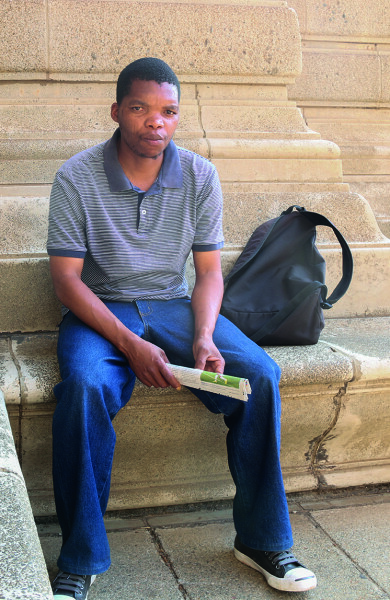 Today, Ndebele divides his time between any part time work he can find, and pursuing MJL workers’ rights. Leaving our meeting, he was on his way to KwaZulu-Natal. His son had been suspended from school because he couldn’t afford to buy a calculator. In rural KZN, it is common practice for learners who fail to bring the required supplies to be excluded from class until parents come to school to discuss the problem. Ndebele had to go to explain his situation, so that his son could go back to school. Ndebele has been accused of playing politics of affiliating with Economic Freedom Fighters, a charge he denies. THINGS GET DOWN: A group of students came to Professor Barney Pityana to “engage” on black consciousness after delivering the Steve Biko Memorial lecture at Wits Public Health school yesterday. Photo: Sinikiwe Mqadi. The annual Steve Biko Memorial Lecture ended in disagreement yesterday when a group of students accused speaker Professor Barney Pityana of “misinterpreting what Biko meant”. The lecture which took place at Wits University was delivered by Pityana with a speech titled: “Transformation in higher education: What is to be done?”. A group of disgruntled students approached Pityana after the lecture to challenge some of his interpretations. “I wish uBiko uyakupokela la ukhona,” (I wish Biko can come after you as a ghost), one of the student was heard telling Pityana. When asked to explain the disagreement, the students refused to comment, but one of them said, “Sistaz you need to understand that this is not a good time on campus, we are scared because you never know when you can be expelled, please understand that,” said one student. Pityana told Wits Vuvuzela said it’s good that students engaged with him and he will be available for further conversations. “It’s good, ideas are like that they float and bang bang, but you need to know that your own ideas are not the ultimate, your ideas are challenged and challengeable … the idea is that the university is not a one way thing … first of all one has to stop and think,” he said. Pityana’s lecture acknowledged the radical approach of some students at South African universities, but he emphasised the need to accommodate many voices in moving towards change. In explaining how the ideas of black consciousness is relevant to current debates about transformation, Pityana said,“black consciousness was a state of mind and a way of life, ideas in themselves do not liberate, ideas are necessary and instruments to inform, drive and energise human and liberate reaction”. A new species of human relatives has been revealed at the Maropeng Centre at the Cradle of Humankind World Heritage site today. The discovery of the fossils representing the new species, Homo naledi, was made last November but was officially announced today at the Cradle of Humankind, by the team led by Wits University’s Professor Lee Berger. The species is named after the Dinaledi chamber (Chamber of stars) in which the 15 individual fossils were discovered near Johannesburg. The discovery is remarkable in that it shows that Homo naledi “appears to have intentionally deposited bodies of its dead in a remote cave chamber, a behaviour previously thought limited to humans”, according to a site dedicated to the find. Berger said Homo naledi is the largest assemblage of human ancestor fossils ever discovered in Africa, and that the fossils appeared to have skulls, feet and hands with the same elements as humans. Abasebenzi bosonkontileka abaqashwe inyuvesi, baqhubeka nokuzwakalisa ukungeneliseki kwabo ngendlela abaqashi babo ababaphethe ngayo. Lokhu kuzwakalisa ukunganeliseki kuqale ngesikhathi abasebenzi beMJL Electrical bekhalaza ngokuthi umqashi wabo akabakhokheli amaholo. Umsebenzi oqashwe iD.L Electrical, ongafunanga kudalulwe igama lakhe ngenxa yokusabela umsebenzi wakhe, utshele leli phephandaba ukuthi umqashi wakhe ubasongela ngelokuthi uzobaxosha nje, uma bethi bafuna ukujoyina inyunyana yabasebenzi. “Umqashi wethu akafuni ukuxoxisana nathi, uma kukhona okhalaza ngakho noma okubuzisisayo uyakukhakhabisa akusongele ,” kusho lomsebenzi. UMnumzane David Letsie ongumphathi weD.L Electrical uzichithile lezizinsolo, wathi abasebenzi bakhe abakaze bakhalaze ngalutho kuyena. “Abakaze bangitshele lutho mina abasebenzi bami, ngiyamangala nje uma sengizwa sengifonelwa amaphepha. Kodwa ke ngizozama ngihlale nabo phansi ngaphandle kwakho [esho intatheli],” umphathi esesicobelela. Omunye umsebenzi osebenzela iMV&LV , naye ongathandanga kudalulwe igama lakhe, uthe banenkinga yokuthi umqashi wabo akawathengi amathuluzi okusebenzi kanye nenyunifomu. “Sifika nawethu amathuluzi uma sizosebenza kodwa kuyenzeka aphuke sisebenza. Kodwa kuyaye kudingeke ukuthi siphinde sizithengele amathuluzi amasha,” esechaza. Umqashi, uSteven Jonhston, uziphendulele wathi abasebenzi bayabuzwa ukuthi banawo yini amathuluzi abo okusebenza ngaphambi kokuthi baqashwe. Eqhubeka uthe umsebenzi wabo uyabaphoqa ukuthi babe namathuluzi abo. “Uma kwenzekile saqasha umsebenzi ongenawo amathuluzi akhe, ngiyaye ngimuthengele yena bese engikhokhela kancane kancane emholweni wakhe uma eseqale ukusebenza,” kusho uJonhston. Ephendula udaba lwenyunifomu, uthe useyi-odile izofika maduzane, “Ngibathengela kanye ngonyaka inyunifomu abasebenzi bami, bese kuthi uma kwenzeka iba nenkinga ngiyayithenga futhi,” esichazela. 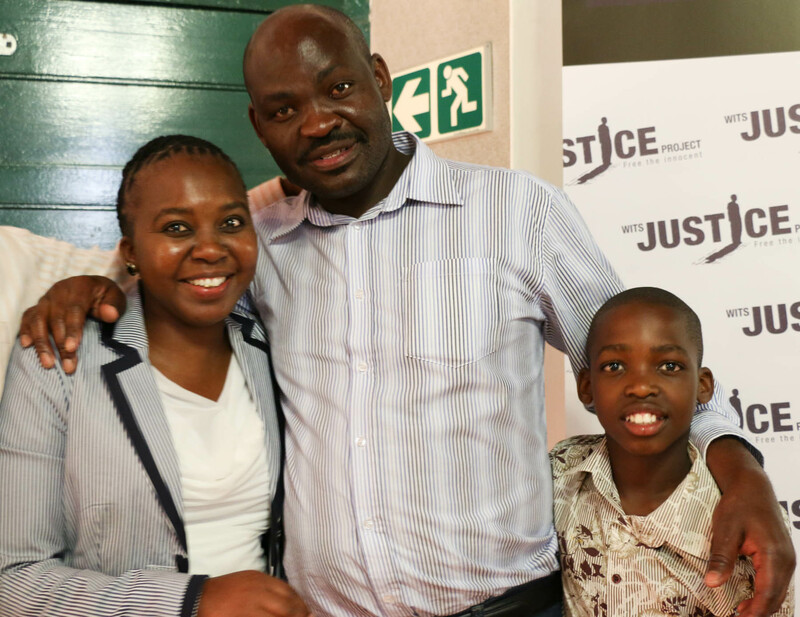 The Wits Justice Project hosted a welcome home party for Thembekile Molaudzi who was imprisoned for 11 years for the crime he didn’t commit. Wits management, his family, friends and everyone who worked on his case came together at the Wits Club last night to celebrate. Thembekile Molaudzi spent 11 years in prison for a crime he did not commit and last night he was able to celebrate his freedom with his family, the Wits vice chancellor and the people who worked on his release. Molaudzi was wrongfully convicted and sentenced to life imprisonment for the murder of a policeman in 2002. Carolyn Raphaely, a journalist with the Wits Justice Project investigated Molaudzi’s case for more than three years. Molaudzi said, “I’m not going to speak long, I just want to thank God and everyone who worked with me.” He then asked his family to join him in a rendition of “Amazing Grace”, for guests. The vice chancellor, Professor Adam Habib apologised to Molaudzi, his family and colleagues for the experience he had to go through in a democratic South Africa. “It was not only a violation of a human right, it was an example when a state’s capacity to deliver is compromised and how it can impact and have adverse consequences on ordinary people,” Habib said. Dismissed MJL Electrical workers, who were hoping to secure their Unemployment Insurance Fund (UIF) last week, face more disappointed as the Department of Labour refused to approve their applications. Former electrical workers who worked at Wits University and lost their jobs earlier this year, were told last week that they will not be able to claim from the Unemployment Insurance Fund (UIF). The workers submitted their application forms to the Department of Labour (DoL), but were told that their PAYE (Pay As You Earn) numbers were incorrect. Richard Ndebele, one of the workers, said the group of 22 went to two different DoL offices in Alexandra and Roodepoort but were given the same message. “I told Solidarity (Wits Workers Solidarity Committee), to pass the message to our lawyer and NUMSA (National Union of Metalworkers of South Africa), but we will wait for them to find out from the liquidator what this means,” Ndebele said. The workers’ former company, MJL Electrical, was liquidated in April this year. Soon after the workers discovered that their employer, George Cressworld was deducting pension and UIF from their salaries but not paying to the relevant funds. The workers will also receive their outstanding salaries from the liquidator. “We were told that we can claim for the days we worked up to the day the company got liquidated,” Ndebele said. Earlier this year, Wits promised to assist the dismissed workers by trying to find jobs for them with other university contractors. But last week, deputy vice chancellor Professor Tawana Kupe sent an email to Ndebele last week saying the University is unable to assist. “I would like to report that I have through my efforts not been able to find any possibility of jobs for the former MJL workers.” Of the twenty two dismissed workers, only 1 has found employment since April. 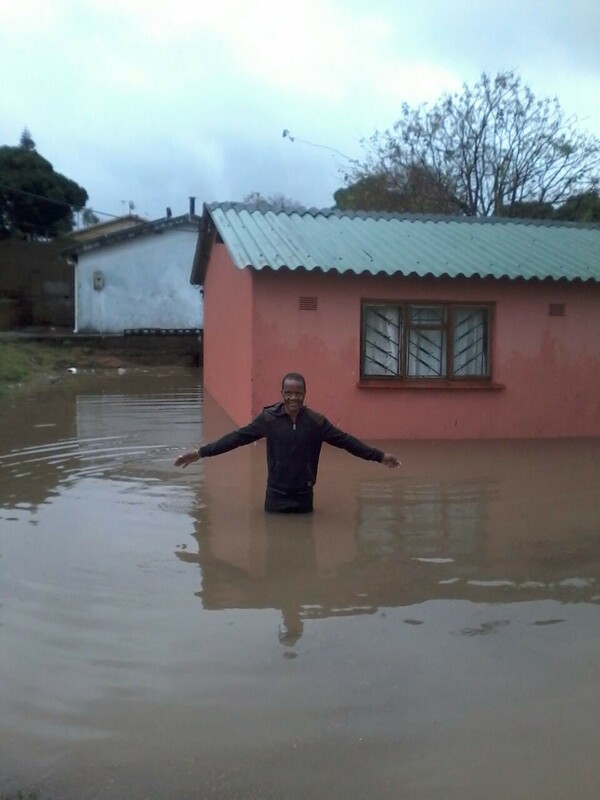 One of the houses affected by the heavy rain that hit KwaMakhutha last night. A heavy rain have left KwaMakhutha houses filled with water last night due to an unfixed pipe by the municipality. The problem started in 2006 when the municipality had to rebuild water drains to accommodate new RDP houses. According to residents, the Ethekwini Municipality said there is no money to fix the pipe. Bongiwe Cele who is a resident in ward 94 said they can’t sleep when it rains because they have to wait for the rain to stop so that they can take water out. “We have children who can even drown in the house. If there was a way to fix pipes by ourselves we would but we can’t” she said. Residents say the pipe drain problem started in 2006 but now it’s getting worse. Nokwanda Mnganga who is also a resident said: “for some of the houses it’s very bad, they need to take the water out as it rains, whether it is at night or not, otherwise their furniture and houses would be damaged”. The ward councillor was phoned several times but not picking up his phone. African language radio stations are now putting their content on new and social media. The South African Broadcasting Cooperation (SABC) has an obligation to broadcast in all South African languages but their online information and news has traditionally mainly if not always been in English. In April, Umhlobo Wenene FM, SABC Xhosa radio station, began making their hourly news bulletins and current affairs content available on Twitter, Facebook, YouTube and SABC news website in Xhosa. We put content in standard Xhosa but (contributors) can use their social media language to comment,” Nogcazi said. Thus far Umhlobo Wenene is the only non-english SABC radio station doing presently making their content available on social media. A correction has been made to the original article which had Lungisa Nogcazi’s name spelt incorrectly as Lungisa Nongcasa. I moved slowly as a child; my grandmother would always say ‘time doesn’t wait for anyone’. Recently, I have been thinking about how we young South Africans are using our precious time. We are wasting it on anger and hate. Would you like to know what changed me? Getting to know the ‘other’, the people from every culture in South Africa and the world. I survived at Rhodes thanks to people like my first year journalism tutor. Every Friday I went to her in tears, pleading for help. Patiently, she explained everything and helped me edit, always generous with her time. Kathryn McConnachie helped me discover that white people are human. Though painful, my time at Rhodes was a gift. Is it wise to continue crying every day? Is wise to hate white people and Mandela? No! Rather, I commit myself to applying my privileges to advancing democracy. It is my responsibility to make sure that this pain ends with me. Yes, it is my responsibility! My transformation did not happen overnight. Nor did it obscure real, persistent injustice. May I put it to you, my dear white South Africans – you must acknowledge that you are still enjoying apartheid privileges. I cannot tell you what you must do to put things right – but I am sure we can figure it out together. My dear black South Africans, I share your anger at poverty and inequality. Your pain is my pain. But, let’s be honest about who is in power. iANC yethu iyamosha! I know you don’t want to hear it, kodwa ke yona iyamosha bontanga. No, Madiba was not able to bring us into the promised land. He brought us thus far, and left us to complete the task. He armed us with a great Constitution, and with the law on our side. We are strong. We are intelligent. We are many. We can do this. What will we say when our children ask – that we were angry young people? And when they ask what we did to make things better? Liyashona ilanga bantu bakithi! Mmusi Maimane was elected as the new leader of the Democratic Alliance today, taking over from Helen Zille who had led the party for eight years. History was made today with the election of the first Black leader of the official opposition, the Democratic Alliance (DA), in South Africa. Mmusi Maimane, 34, who originally hails from Dobsonville, Soweto, is the youngest person to head the party. He emerged the clear winner after more than 1000 delegates cast their ballots at the party’s elective congress in Port Elizabeth. The crowd screamed and chanted “Mmusi! Mmusi!” as outgoing leader Zille announced Maimane as the new DA head. Addressing delegates after his victory announcement Maimane said, “whether or not you voted for me, let us today unite behind our shared values and take the DA forward”. Maimane’s biggest threat in the race for the top position in the party was Athol Trollip who was elected the Federal Chair.